There are some Tibetans who believe independence is our birthright, and historically speaking, they are right. How we deal with that is that we are a democratic society, and we are all entitled to our own views — we try to maintain it as difference of views, but not divisions. Yes. Otherwise why would I leave my job at Harvard and go to Dharamsala? You have to always walk with hope that tomorrow will be different and better. If that hope disappears, then I think it’s a very lonely place. You have to believe that he will be able to return to Tibet during his lifetime. [...]It sounds like you were subject to Chinese phishing attempts via email attachments? Does that happen often? It’s where the Buddhist philosophy comes in — don’t have attachments! 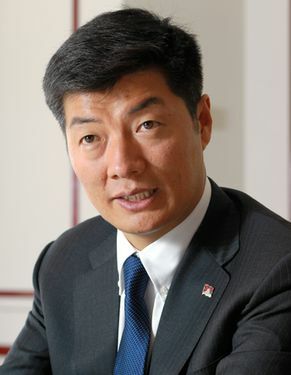 [...]SANGAY: Because interests of Tibetans inside Tibet is our primary concern. So how to empower them, how to put them in leadership positions so they can administer their own interests, you know, as per the Chinese constitution. That is — that is what we seek. Now, you raised a very important question, whether Hong Kong be a solution. As per Article 31, a specially administrated region is allowed in the Chinese constitution based on that — basic law was drafted, and one country, two system was allowed. And that is allowed for Macau. Hence, what I say is that Tibet is not a constitutional challenge for China, because there is already a constitutional provision — Article 31, or even if they want, they can look at Article IV, the minority nationality act or Article XII of the Chinese constitution and be there as a basis of solution. With foresight and conviction, Members of Congress from both sides of the aisle have legislated over the years to help Tibet. This has given political, moral and financial support to the His Holiness the Dalai Lama’s vision of a peaceful solution to the Tibet problem though the “Middle Way” approach that would provide for genuine autonomy for Tibet within the framework of Chinese constitution. Tibet is not a constitutional or an institutional problem for the government of the People’s Republic of China. As per Article 31 of the PRC Constitution, China has created a separate institutional mechanism of one country, two systems for Hong Kong and Macau. The Chinese leadership has also displayed the political will by forming a cabinet level committee to deal with Taiwan. However, when it comes to Tibet, the Chinese leadership has neither employed the available constitutional mechanism at its disposal, nor has it shown the political will to resolve the issue peacefully. Opposition to the Article 31 policy goal does exist among Tibetans due to concerns over the temporary nature of Hong Kong’s status under the Basic Law. In a recent interview with C-SPAN, Sangay talked about the structure of the Central Tibetan Administration, his own position within, engagement with the international community, and tensions with China (among other topics).